Congratulations! Anthony Fung’s new book is finally out! Here is some information of his book. Please get your library have a couple of copies of this book. This book examines the way transnational media companies have entered the Chinese entertainment market. 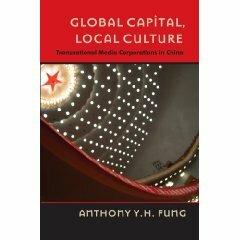 Based on the authors ethnographic work and over 100 interviews with senior executives in global media corporations, including Warner Bros. Pictures, Viacoms MTV Channel, and Nickelodeon and News Corporations Channel V, the book analyzes the concrete globalization/localization strategies of these corporations and how they cope with the various political and economic constraints of working in China. Anthony Y.H. Fung is an associate professor in the School of Journalism and Communication at the Chinese University of Hong Kong. He received his Ph.D. from the School of Journalism and Mass Communication at the University of Minnesota. His research interests include political economy of transnational media corporations, popular culture, and cultural studies.